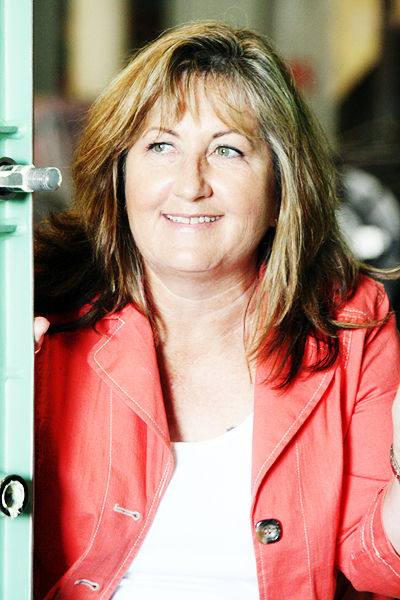 Hi all I have an AMAZING guest post for you today! T.A. 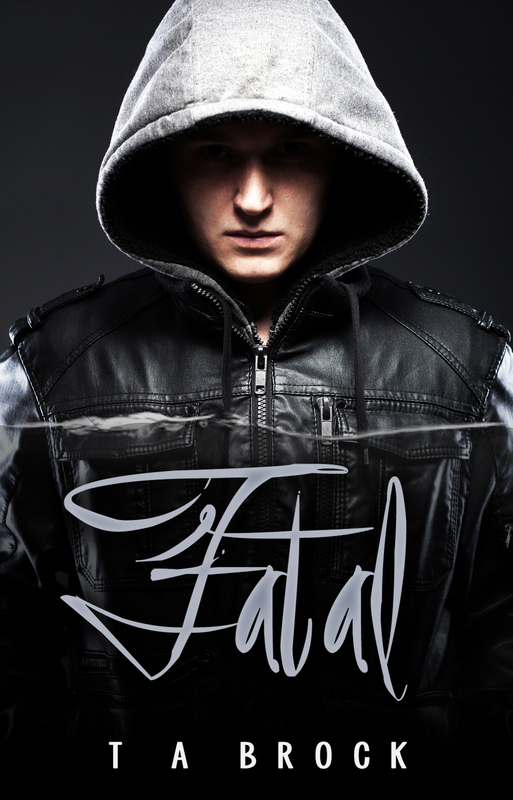 Brock author of the fantastic YA Paranormal Romance FATAL has given us some selections from the Zombie cookbook! Read on to discover that there’s more than brains on the menu for these guys! Hi all! *waves* I’m so excited to be guest posting today, and I’ve got something super fun to share with you. As some of you might already know, my zombies are not your typical brain-eating, skin-ripping, stank-rotting fleshbags. Nope. They. Is. Civilized. Most of them anyway. Now don’t get me wrong, my dude, Grayson, has been known to rip into a spare rib or two with his bare hands—relax, he gets them from the market just like everyone else—but for the most part, they eat their flesh with a knife and fork. From a plate. Or even a diamond-crusted platter. Now might be a good time to mention that the zombie diet consists of RAW meat and excessive amounts of water ONLY. They cannot eat vegetables. Lucky? Maybe. Whatever. My point is, unless you’re wearing Lady Gaga’s meat dress, there’s a 97% chance they WON’T want to eat you. If you ARE wearing Lady Gaga’s meat dress… then, well, I don’t know. Run, maybe? Oh, beeteedubs, do NOT attempt these recipes unless you are of the risen dead persuasion. Trust me on that. 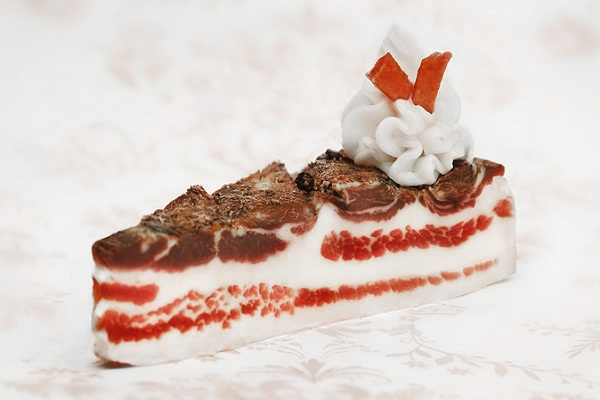 Arrange the strips of bacon on a plate in a decorative pattern. Remember, you eat with your eyes first so make it look pretty. Try a lattice pattern or twist the bacon into rosettes. Whatever suits your fancy. 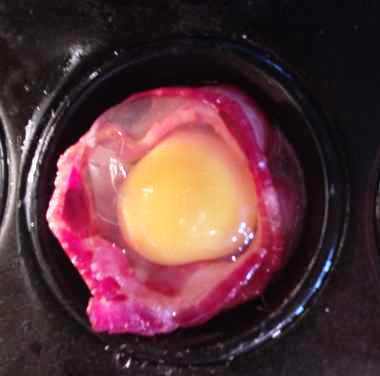 Crack the eggs over the bacon design (if using whole) or pour over (if scrambled). Serves two. 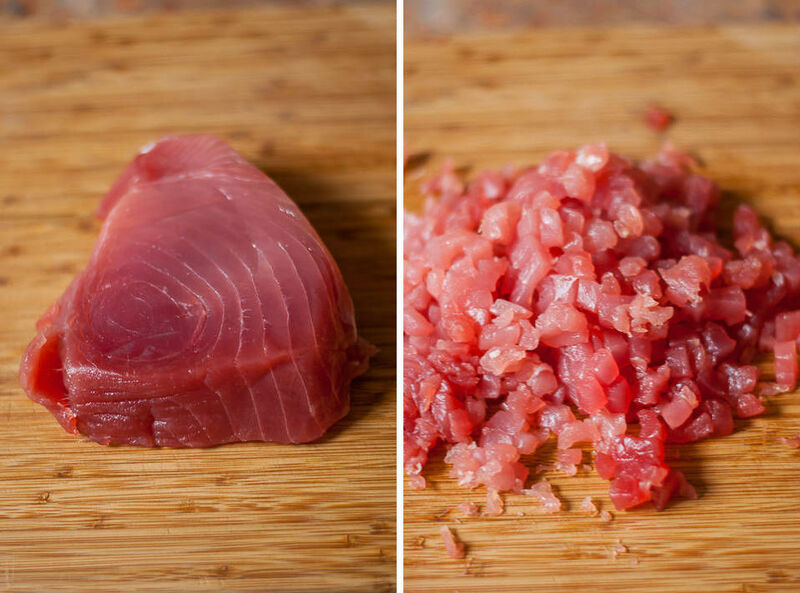 Cut each bacon strip in half. 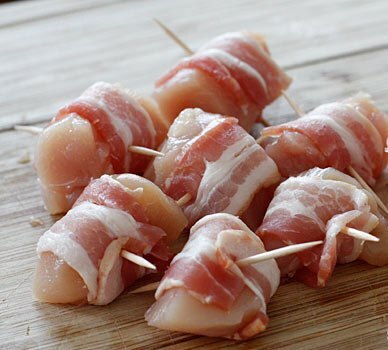 Wrap bacon around strips of chicken and secure with toothpicks. Easiest recipe EVER! In a large mixing bowl, stir all ingredients together until well incorporated. Don’t be afraid to get in there with your hands (just don’t lick your fingers!). Roll into balls that are approximately one inch in diameter. Serve family style, on a platter. 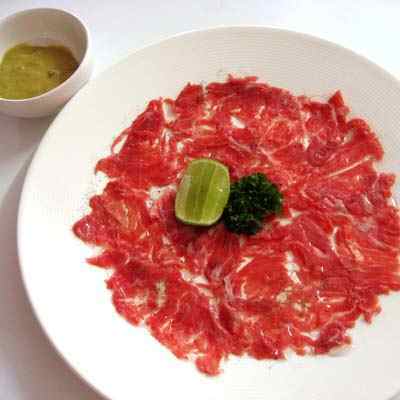 For carpaccio: Cut meat into paper thin strips. Layer strips artfully on your serving plate. Remember to be creative in your design. Finish with a drizzle of ice water. For tartare: Dice meat into very small pieces. 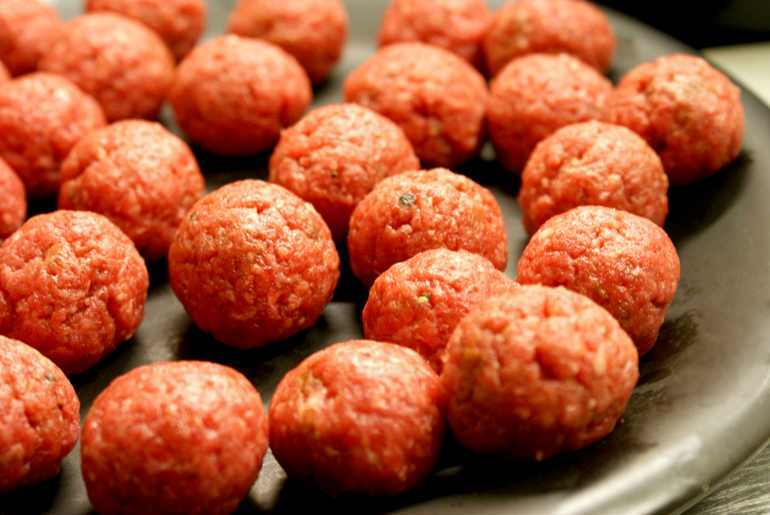 In a mixing bowl, toss the meat with 2 Tbs. ice water. Using a two inch ring mold, press meat mixture onto serving plate. Carefully remove the mold. Garnish with mint leaves. IMPORTANT: Do not eat the mint no matter how inviting the scent might be. It is toxic if ingested. It is my understanding that you, the reader, are curious as to how Kat Daemon came up with the idea for her novel, Taming Darkness. Isn’t that cute? You naturally accredited her with that much talent. 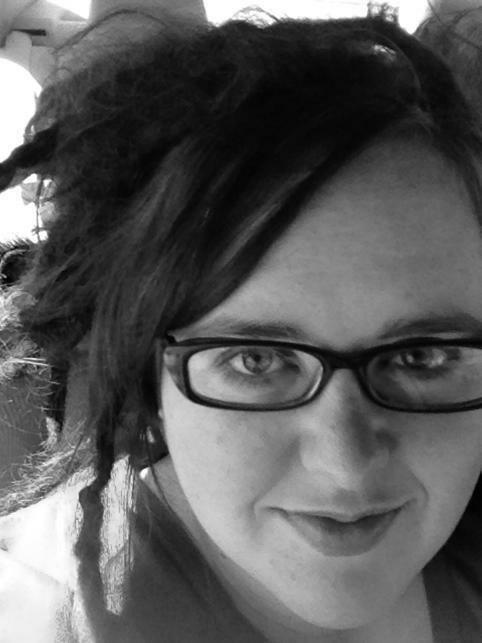 The girl is pretty decent at being a scribe, but you must understand, that is all she is. Here, allow me to enlighten you as to what really happened. I found Kat last winter, all alone in her living room clad in sweats and a hoodie. It was her birthday, and she was staring at her laptop waiting for some acknowledgement of her day to appear via a digital message. Pathetic, I know, and being the generous demon that I am, I took pity on her. You see, Kat had written about me before, she’s a bit infatuated, and who can blame her? The problem with her past writings is that she always failed to make me the main attraction, and I do not like to play second fiddle to anyone. It was time to remedy this. So, after clouding her vision with what she comically refers to as “muse dust,” I laid the contract down before her: A novel that finally tells my side of the story. Sure, you are all familiar with the tale: Revolution in Heaven, temptation in the Garden of Eden, and the creation of Hell. But, all you know is what they have poisoned your brain with. Lies, I can assure you, and nasty ones at that. It was time to clarify what had occurred. With the seed planted, the tale began to unfold, and I guided Kat, making sure that she got every detail just right. I even insisted that she include my naughty, serpent sidekick, Lilith, in the tale, because I have learned: When Lilith is happy, then I am happy… in more ways than one. Our next stop was a train ride where I took her into Manhattan and showed her all the spots that she needed to write into the story. Her eyes were ablaze with excitement as she took pictures and made notes for later reference. And yes, if you are wondering, my own home was included on the tour. I even invited her into my bedroom, a private spot that few have seen and survived to talk about, mostly because a night with me is worth losing one’s soul over. She was hesitant at first, but I convinced her that if she was going to write an accurate novel, thorough research was in order. Finally, I allowed Kat to become privy to my deepest, darkest secrets and showed her what happened when I encountered the one creature that showed me a glimpse of Heaven once more. Once I knew I had obtained Kat’s sympathy, I trusted her with my tale implicitly. True, my intentions were for my own self interest, but I think we can all agree that in the long run, it worked out for everyone. I was finally able to get my story told, Kat got her book deal, and you, dear reader, get a rare glimpse into the magnificence that is me. 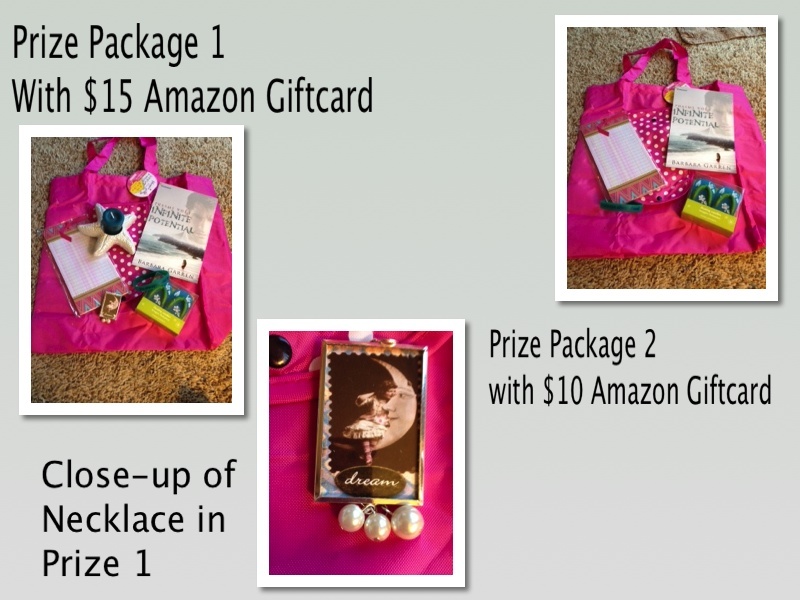 There is a tour wide giveaway for the blog tour of Taming Darkness. As you all know, I wrote a little trilogy about the devil and guess what? Book one, Taming Darkness, releases today! I cannot begin to tell you how thrilled I am to finally have my baby out into the world. I have been living with these characters for many moons and I am so happy that you can finally meet them. As a special treat, guess who is here today… that’s right, you met him a week ago, The Dark Haired Man from Barbara Garren’s book, Phasms Infinite Potential. Care to guess who he brought along? If your answer was the devil, then you are correct! Here for a rare appearance, Lucas Starr, answers some questions and gives us his thoughts on public image, war and that one woman who got into his head. I agreed to meet Lucas at his penthouse apartment on New York’s Upper East Side. I wasn’t disturbed or suspicious about his request of venue. He’s a business man, with pressing demands on his time and resources and the request made imminently more sense than asking him to traipse over to my location. Not that I have a location, shifting between alternate planes of reality and all. But I digress. I was introduced to Lucas by an industrious young acquaintance who, while not necessarily currying favor with either of us, would certainly benefit from the details of our conversation. Poor thing, she neglected to first ask the price of our cooperation. Having set the meet for this particular evening, I arrived to find an exceedingly large number of beautiful men and women exiting the apartment. Lucas met me at the door, waived me in and proffered a drink. I had to refuse, as it was difficult for me to maintain my corporeal form as well as imbibe. The main room was large, with a massive fireplace and black, granite bar. A balcony overlooked the city, affording a spectacular view of Central Park, and one entire wall displayed a quaint collection of swords, knifes, armor and other such items. We settled into a pair of comfortably heavy oak chairs, detailed with gothic carvings of gargoyles, imps and such. The place was charming beyond words and Lucas was an attentive host and subject. DHM: So, Lucas – you seem quite the gentleman. Articulate, erudite, with excellent taste. And yet, you have such a horrible public image. All those horns , fangs, pitchforks and a tail. Why do you believe the public with this campaign of vilification? Lucas: I think we can both agree that people fear that which they do not understand. Ignorance stirs the imagination, folklore gets interwoven with truth and the facts seem too far fetched to be believed. They want to hate me and condemn me, because I had the courage to carve my own path. They paint me as being uncivilized because accepting me as civil makes me too much like them. Imagine how hard it would be to look in the mirror and see me staring back. (Not that they’d protest, I am beyond beautiful.) Then who would they point a finger at? Creating a monster has given them a false sense of security. They don’t even need me. They are their own demons. Lucas: I’m a business man, not a politician, although I know more than my fair share. I’m not about to run a campaign persuading the public to adore me. I do my dealings in the dark, and I want my clients to come to me of their own free will. The world has become one big carnival of bandwagons, and I am not handing out horns and a lifetime membership to those willing to fight for my cause. My time will come, and if nothing else, I am extremely patient. DHM: So, man to man here – what WAS it about this particular human female; Maria, that made you so, well, whipped? Surely, in the length of time you’ve existed, you’ve come across truly exquisite females who didn’t require such sacrifice. The challenge wasn’t all that, was it? Weren’t you really looking for a way to tangle with Michael and prove you were the better, uh, Angel? Lucas: Like all my conquests, it began as a game. A beautiful, twisted game to pass the time. When you’ve seen as much as I have, nothing phases you anymore. Every action is propelled by the need to amuse yourself. Sacrifice is a word that I don’t feel is part of my vocabulary. I carry out decisions in ways that I feel are in the best interest to me. With Maria, it was no different. When I looked at her, I saw myself shining back in her eyes. You can call it reckless narcissism if you’d like. Perhaps my judgement was jaded by her, dare I say it? Light. Either way, as you said earlier, I have excellent taste. As for Michael, there is no question that I am the superior being. We have “tangled” many times, it’s a healthy way for me to release my pent up anger and eternal frustration with the monotony of this crumbling rock I have come to accept as home. DHM: How about something a bit more plebian, for the masses if you will: If you could change any one thing in your past, any single decision or outcome from your millennia of existence, what would it be and why? Other than the whole “cast down from Heaven” bit, of course. Lucas: (laughs) I don’t regret the rebellion. I did what I had to do. I made my choice and Michael made his. The outcome was rather unfortunate, but that’s just one battle of the great war. Trust me, that story is not over. If I could go back to any moment, I think I wouldn’t have waited so long to tempt that famous carpenter. I went after him when he was in his thirties, and lets face it, in ancient times that was the equivalent of retirement age. It’s not as much fun to bully the elderly. I didn’t really have my heart in in it either. I should have gone after him when he was a teenager. Teens are so much more persuasive. What can I say? You live, you learn. DHM: Anything you wished your adoring fans and minions knew about you? Any last words, heh, heh? Lucas: I think it’s time we put away such tedious labels as good and evil. I did what I had to do to survive, and unlike my former brethren, I have the ability to evolve. So I think at the end of the day, the people must ask themselves who would they rather have by their side? An army of angels that can’t break away from the old regime, or a figure who can introduce them to the possibility of a brighter tomorrow? After all, I am always willing to make a deal. Taming Darkness Blog Tour Schedule! Music is a huge inspiration when I write. Although the original concept for Phasms: Infinite Potential stems from an incident in my real life, it’s the music I listen to while writing that makes the story, the characters and the concept come together. Once I have the premise ironed out, I build a playlist of songs that propel the story forward. Sometimes it’s the rhythm, sometimes the lyrics. Sometimes it’s something so intangible, I just want to grab hold and convey the feeling in the words I’m writing. For Phasms, I had the dilemma of making sure the reader understood the depth of Kelsi’s loss without bogging the book down in so much grief, they wouldn’t want to read on. The book really took off when I pulled two songs from the band FUEL. The first, “Leave the Memories Alone,” is a soulful ballad of love lost but not forgotten. It’s about remembering what you’ve lost and finding a way to savor those memories without falling into total despair. The second song, “Falls on Me,” is a song of hope, of learning and building from the beauty of love, no matter how ugly or jaded the circumstances surrounding the end of that love. It’s about allowing your self to fall into the black hole of depression and climbing back out. About finding the strength you need to carry on. I think most people are surprised when they find out the music I listen to and how important it is to my story and character development. I have a mix of Staind, Burn Season, Nickelback, Shinedown, Social Distortian, Tantric, Stereoside and Oleander on the playlist for books 1 and 2. I’ve added some and taken some away, but when I heard “Is Your Love Strong Enough” by How to Destroy Angels (from The Girl With The Dragon Tattoo soundtrack), I knew it would set the theme for the final book in the trilogy. It’s achingly haunting, eerily beautiful and absolutely the song I needed to finish things up. And no! That’s not a spoiler!